This book features the latest exhibition stands and focuses on both the details and atmosphere of the exhibition display design. Divided into seven sections - Architecture, Commerce, Culture, Electronic, Industry, Science and others - this comprehensive volume shows how designers use colour, light, materials, and decorative props to create exhibits that are truly unique, innovative, and memorable. 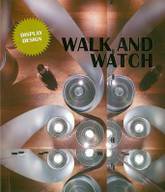 As a book specialising in contemporary exhibition stand design, 'Walk and Watch' collects plenty of works from excellent design teams. Among these are Eventscape, D'ART DESIGN GRUPPE GMBH, Space Potential, Triad Berlin, ATELIER BRUCKNER, Tokujin, Sinato, SEMBA Corporation, Snarkitecture, Cinimod Studio, NORM.ARCHITECTS, Labscape, nkbak, LAVA, Ueberholz, plajer& franz studio and many more.